Are you one of the people who feel down in the winter months from the lack of sunlight during the shorter days? If you live north of latitude 35, then you may be very low in Vitamin D.
Low Vitamin D levels are linked to increased risk of osteoporosis, brittle bones, psoriasis, cancer and heart disease. 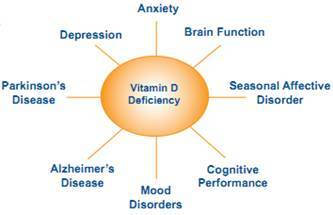 Many symptoms of Vitamin D deficiency only appear after the deficiency has existed for many years. The first sign can be a fracture from a simple fall. Sunlight is a major source of Vitamin D. Vitamin D regulates the function of 36 organs and their tissues; in fact there are specific Vitamin D receptors in almost all the tissues in our bodies. In addition to maintaining healthy calcium levels, vitamin D also regulates hormone secretion and supports the immune system. From the prevention of certain cancers to the lowering of blood pressure in someone with hypertension, Vitamin D is essential for maintaining optimal health, and/or healing some diseases. Be sure to get your Vitamin D levels checked.